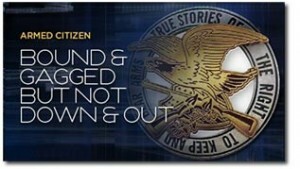 From NRA.org, January 2012 – Zachary Rogers, 26, was working late one night at the 21st Amendment liquor store. It was just past midnight when an armed man wearing a ski mask entered the store and forced Rogers and another store employee, Alicia Grabarczyk, 25, down a hallway toward an office where the safe was kept. With a concealed handgun in his front pocket, Rogers chose his moment of opportunity carefully. I believe these are true stories. What bothers me is those crooks being shot also show up in the statistics as “killed or wounded by gunfire” The police only collect generic data if a gunshot is involved, no differentiation is made in the final tally of State and National statistics. The reason is clear. If no one had a gun then the criminals would not be killed and killing by gunfire would go down a lot. Too bad but that’s the way our government looks at things.